There are a number of theme parks located less than an hours drive from Brisbane, mostly down towards the Gold Coast. They come in all shapes and sizes and whether you like death-defying roller coasters, seeing stunt shows or patting furry animals, you're sure to find something you'll enjoy. Each theme park is home to plenty of rides, entertainment, food, shopping and a chance for some great photos mid-freefall! They all even have dedicated kid zones, perfect for keeping the little ones entertained. Buy your tickets online for great deals and specials. You can also book a theme park transfer from your Brisbane hotel to the Gold Coast, saving you the hassle of organising the trip! Visit Movie World, Sea World, Wet n Wild and Paradise Country as often as you want in 14 consecutive days with this great-value multi theme park pass! For just $179, you will save hundreds off admission prices and still be able to see everything that Movie World, Sea World and Wet n Wild have to offer! The 14 day pass commences from your first visit and can be redeemed at any theme park. Combine with a theme park transfer from Brisbane and have your entire day sorted. 3 For 3 Pass - 3 Theme Parks Within 3 Consecutive Days! Visit three of the Gold Coast's must-see attractions over 3 days and save money with a theme park pass! Providing one day admission to Movie World, Sea World and Wet n Wild over 3 consecutive days for just $129. This pass is perfect for anyone visiting Brisbane or the Gold Coast for a short time. Visit Dreamworld, WhiteWater World and SkyPoint until 24th December 2018 as many time as you want with this great-value multi theme park pass! 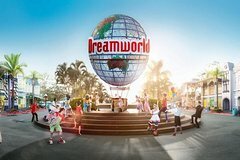 For just $94, During your visit to Dreamworld, you can experience all of its best attractions including Dreamworld Express, ABC Kids World, Tiger Island and Wipeout. With something for all ages to enjoy, everyone will love a day out at Dreamworld. Combine with a theme park transfer from Brisbane and have your entire day sorted. Need to feel fear and adrenaline pumping through your body? Or maybe you just want to pat furry animals and play mini golf? Either way there are theme and leisure parks located around Brisbane that make for a fun day trip or half-day adventure. Airport Con-x-ion is the leading provider of airport and theme park transfers from Brisbane to the Gold Coast and beyond.